How durable are Teehon Offroad LED lights? What is the difference between the Spot beam and Flood beams Optics? Our Spot and flood beam Optics are both of durable PC and offer the highest in forward projecting LED lighting performance. Visually, these are both plastic components that encompass the LED and project the light outwards. The spot optic system comes in transparent PC len without any diffusion. Our flood Optics comes in either a diffused type or Wider pattern without diffusion shapes on the len. The spot beam optics system shoots the lights in longer distance, while the flood beam optics system performs lighting in wider coverage. Both of these optics are great for their individual purposes, and if desired, they can work together for a perfect combination of distance and spread in a offroad led light bar rather than a LED work light. What is the difference between the Hybrid beam and combo beam patterns for our led light bars? Bascially, the combo beams come with the spot beam optics in the middle and flood beam optics on the left and right part of a led light bar. The combo beam types can only apply to the single row, double row or four row led light bars. 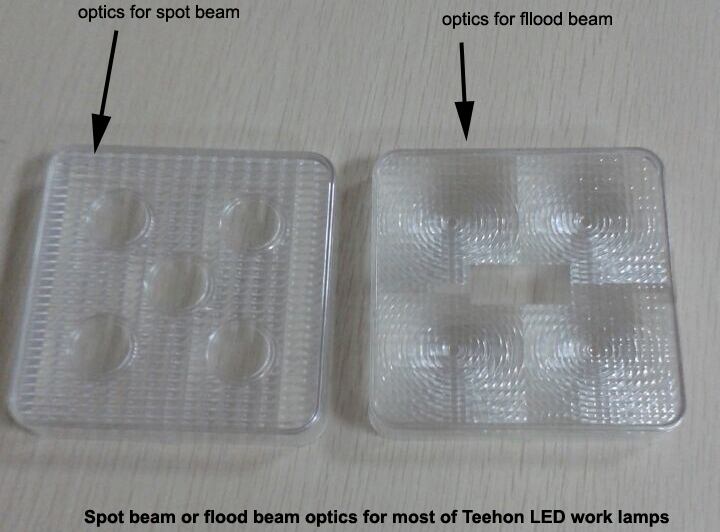 The same corresponding optics in spot and flood beam types must be used on the LED light bar. However, hybrid beam optics can only be suitable for double row CREE led light bar in hybrid beams. More flood beam optics will be needed when spot beam optics are installed in the middle. Comparably, the hybrid beam optics in combination will provide more excellent lighting performance with farther and wider viewing angle. Can I mount Teehon lights vertically with any mounting brackets on the market? Teehon lights were designed and tested assuming the light is installed in the horizontal direction. Installing lights in the vertical direction could cause premature failure of the bracket. But all of our lights have been tested work well with all of the mounting brackets if they are installed correctly. What is the use of waterproof warranty sticker on the cable of Teehon lights? Can I take it off or spray paint over it? No! This is a physical proof that prove they are produced by Teehon and assured during valid warranty period. Please do not remove it or paint over it. Can I run my Teehon lights with a 14 volt A/C signal? No. The Teehon lights were designed for DC voltage. Lights operated at 14 volt A/C may not be damaged, but could flicker or appear dim. Can I run my Teehon lights with a 80 volt D/C signal? No. The Teehon lights were designed for DC voltage ranging from 9V to 60v DC. Lights operated at 80 volt A/C may be damaged, and the lights could flicker or appear dim if the D/C signal is below 9V. Please tell us in advance that you need 80V DC voltage range before you place order. We are able to provide you custom-made PCBA versions whose voltage range can be up to 80V DC, but the necessary surcharge must be added for relevant components. Can I run my Teehon light in an A/C wall outlet? No! Teehon lights are designed for DC voltage. Connection to an A/C wall outlet will very likely permanently damage the light. Can I install my harness wire with relay under the hood of vehicle? This is not recommended. Teehon recommends installing the relay in the cab of the vehicle to protect it from extreme temperatures and moisture. I see the current draw in the catalog, but what input voltage is that measured at? All currents shown in the catalog assume a 12Vdc and 24Vdc input voltage, which is the typical voltage of a fully charged automotive lead acid battery. What is the difference between the round LED work lights and high power LED driving lights in terms of 96W and 185w LED drving lights? The round LED work lights and 96W or 185w LED driving lights are housed in the same cast aluminum housing and have the same shape and profile. The difference is their beam adjustments. The round LED work lights uses our Optics System in a configuration which comes in either Spot or Flood options. The 96W and 185W LED driving lights needs transparent covers outside the lights to provide optional spot or flood beam. I connected my light to my car and it doesn work. Now what? Several items could be preventing the lights from properly working. The below items can help in troubleshooting. Try connecting the wires of the lights directly to a fully charged car battery. If the light works then there is a problem between the battery connection and the light. Potential problems include insufficient power supply,a faulty switch, faulty relay, insufficient thickness wire, and improper grounding. When I connect my light directly to my battery, it is at full brightness, but when I use a long cable to install it, the light is dim. What is wrong? You need to make sure you are using an appropriately sized gauge wire for your installation. This is especially important if using a long wire from the battery to the light installation. If the wire gauge is too small, there will be significant voltage dropped across the wire, preventing the light from powering up fully. My light is not working. Should I disassemble it and troubleshoot it? No! Teehon lights are precision assembled in such a way to ensure no moisture can get into the light. Disassembling can destroy this seal and will void the warranty. Please contact your local dealers immediately for technical support. My Teehon LED light bars make a high pitched noise when they are installed onto my jeep! Why? The problem may arise from the battery such as lower voltage or poor battery. The audible noises may be activated by the reaction of inductor inside the light bar. Please replace a new and fully charged battery to see if the problem is still there.